You can read the press release about UKIP Friends of Israel's launch. Julien Conway is director of UKIP Friends of Israel. There are no banners from the DCB or McKenzie camp yet, I may have to make them myself in the interests of fairness if they don't hurry up! Jason Smith pulled out a few days ago, saving his energies for a future battle and Gerard Batten pulled out a week or so ago and is backing Tim Congdon. If this was a website competition DCB would be the winner, Farage a close second, Congdon a disappointing third and McKenzie on nil points as he doesn't have one. But it's not a website competition, it's a leadership competition. So far it's looking like a two-horse race between DCB and Farage. DCB is turning out to be a surprisingly strong candidate and can easily match Farage's support amongst UKIP's online community but if the last leadership election taught us anything it's that the views of the online community don't really represent the views of the majority of the party. Smarkets think it's a foregone conclusion but they've got 6 candidates listed, only two of which are in the running so I'd take their prediction with a pinch of salt! It's going to be a tight result - a lot tighter than Smarkets reckon - but my money is on Farage. David Campbell Bannerman's website went live last night and it's by far the slickest website of the leadership candidates so far. DCB has some very clear plans on where he wants to take the party and how he intends to do it. He's got the experience and the drive to do it too. The only thing that really concerns me about his plans are the merging of the party leader and head of policy job. DCB is already an MEP and head of policy and he also wants to add a third string to his bow: namely party leader. I have my concerns about DCB's record as head of policy but that shouldn't distract from what really is a superb campaign website that frankly outshines the party's main website. The country is facing crippling debt and Britain's deficit requires substantial cuts in the government budget to stabilise the economy in the long run. And some how, we are seriously debating whether people should be paid to lose weight and quit smoking. It was good to see Fiona McEvoy from The TaxPayers' Alliance on BBC breakfast this morning pointing out just how ludicrous this proposal is. As front line NHS services are at risk, those who choose to do things that potentially harm their body and quality of life are to be rewarded for changing their habits. All will be paid for, of course, by the hard working taxpayer's who are rewarded for living a healthy lifestyle by paying others to do the same. Practically, this proposal is crackers. It is well known that smokers can relapse very easily. A 28 day period of quitting could mean nothing to the person involved, except for a period during which they stop smoking in order to cash in before resuming. As for being paid for losing weight, will it be by the pound? It is well documented that those who crash diet (presumably in this case for a greater cash reward) will still be engaging in poor dietary habits. Oh, and please note: the debate is about whether the scheme is extended, not introduced. There are plenty of examples of this type of rubbish going on in Britain. Just look: here, here and here. Michael Heaver is an author at Bloggers4UKIP. Bloggers4UKIP has been ticking over nicely for just over 2 years and getting about 5,000 page views per month. We have 122 Google Connect followers and is visited regularly by academics and the EU Parliament. What we need is more members and supporters to contribute to the blog - most of the content is still written by me and I never intended Bloggers4UKIP to be a full time blog for me! Here's how it works at Bloggers4UKIP in a nutshell: I am an administrator, not an editor and as long as you don't say anything that is likely to get me sued then pretty much anything goes as long as it's relevant. I am currently trying to arrange an independently judged competition for the best article written for Bloggers4UKIP during October to mark our 2nd anniversary (Bloggers4UKIP's birthday was a couple of weeks ago) so if you want in, get in touch through Facebook, via Twitter (@bloggers4UKIP) or the contact page on Bloggers4UKIP. Now the second part of the message: following Bloggers4UKIP. As I said, there are 122 Goggle Connect followers of Bloggers4UKIP which is a fantastic show of support but 150 would be nice! You can follow Bloggers4UKIP by clicking the Follow button under the picture of David Cameron on the right hand side of the blog. You can also follow Bloggers4UKIP on Twitter - @bloggers4ukip. One final following opportunity - Networked Blogs on Facebook. Why not show your support by following Bloggers4UKIP on Facebook. We only have 7 followers on Networked Blogs as it's only been promoted for a couple of weeks. We now have 124 followers on Google Connect, 8 followers on Networked Blogs and we've had an extra couple of followers on Twitter and an offer to write for Bloggers4UKIP. Thanks to those readers who have decided to follow us! Several people are already signed up to write for Bloggers4UKIP and there has been an offer already today to write for the blog. During the month of October I am inviting new contributors to come forward and write for Bloggers4UKIP. The fine details need to be worked out but one post per contributor written between the 1st and 22nd of October (by anyone but me) will be sent to Nigel Farage and the author of the post he likes the most will receive a signed copy of his book, Fighting Bull. Apparently some other party has been having a leadership election as well and they announced their result today. 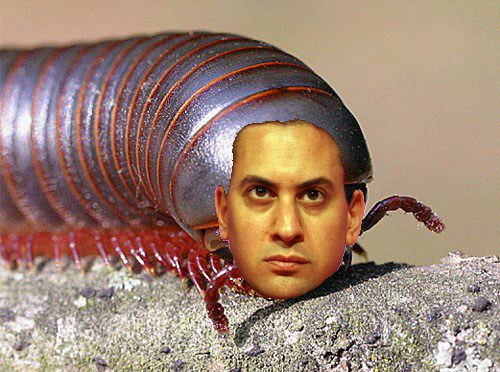 Ed the Millibeast won the contest to be leader of something called the Labour Party by getting less votes than his brother David and convincing the unions that he was the candidate most likely to give them lots of money if the country ever decides to elect a communist again. Surprisingly, there was only one black woman amongst the 5 candidates despite Harriet Harperson overseeing the election. Presumably she was unable to change the rules in time to enforce a 50/50 male/female, white/black, disabled/able bodied, straight/gay quota. The token woman candidate, Diane Abbot, came last by quite a margin. 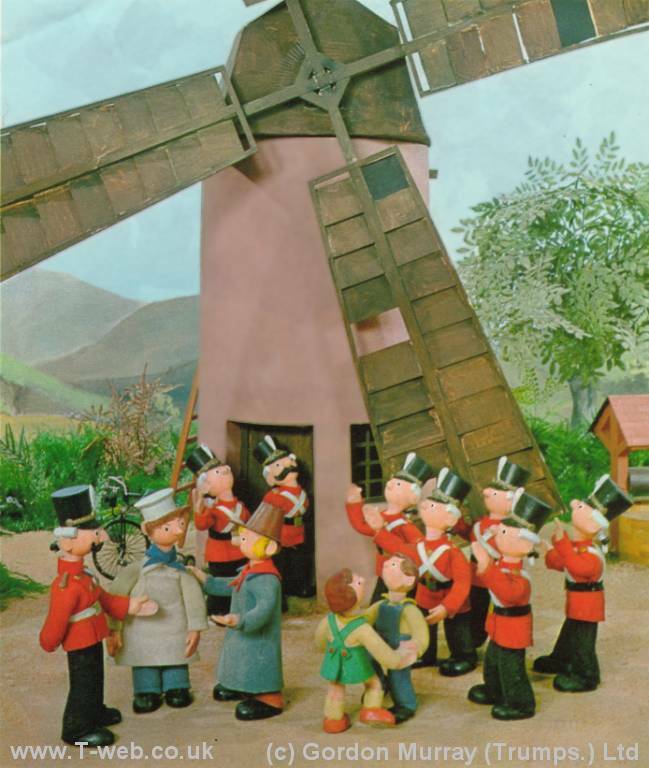 It's a good job Labour members are so much better than the rest of us otherwise some people might unfairly suggest that Diane Abbott was so comprehensively rejected because she was a nobody placed into the contest thanks to the sympathy nominations she received from the other candidates. Ed the Millibeast gave a rousing victory speech in his best working class Eton accent which I'm sure was terribly motivating to the adoring masses in the conference hall. It certainly motivated me ... to renew my UKIP membership when it expires. Tim Congdon's leadership campaign website is up and running. I'm not sure how long for, I've only just found it! First impressions? It looks like an old UKIP website and it's impossible to tell what's a link and what's just text formatted exactly the same as a link. There's lots of background information though and details of what he wants to do as leader. Second impressions? It looks like an old UKIP website and it's impossible to tell what's a link and what's just text formatted exactly the same as a link. If Tim Congdon doesn't make it as leader, I hope the new leader gives him a job. Nigel Farage has launched his Nigel for Leader website today. First impressions? It looks good, it's well "branded" and contains facts, not just a sales pitch. Second impressions? Not the most flattering picture, too much emphasis on young people and in one of the videos he looks uncomfortably out of place while said youngsters eulogise him. The site looks great and the written content is good but it focuses too much on youngsters. It reminds me too much of Cast Iron Dave's "hug a hoodie" disaster. I'm disappointed to be honest, I expected a better website from the Farage campaign. I'm still supporting Nigel as leader but the website could have been better. The Bulgarian Minister for the Diaspora, Bozhidar Dimitrov, has announced that up to half a million Bessarabians are expected to take advantage of a change in the law to give them Bulgarian citizenship. 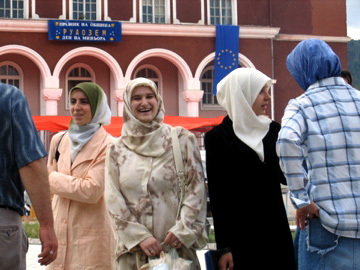 Over 17,000 ethnic Bulgarians living in Moldova and Ukraine have already been given Bulgarian passports, allowing them to live and work anywhere in the European Empire. An additional 300,000 ethnic Hungarians living in Serbia will be allowed to apply for Hungarian passports in 2011 and Romania has been handing out passports to Moldovans. Spain, Italy and Portugal have all been handing out passports to the children and grandchildren of émigré, most of which live in Latin America and the Caribbean. This wouldn't be a problem, of course, if the recipients of these new passports stayed in the country that had so generously granted them but of course they don't. They make their way to the richer western European countries where they have the right, as EU citizens, to live and work, to claim benefits and to receive any services the "natives" are entitled to. It doesn't matter that we don't have enough houses or jobs to meet the demands of people already living here, every one of the estimated 5m new EU citizens will have the right from the day they get their passport has been given the right by a foreign government we have no control over to live and work here. The way things are going, they'll be giving away EU passports for 4 Weetabix tokens and a £5 postal order. The opening of the world's largest wind farm off the Kent coast today has been described as "the environmentalists greatest con to date" by Nigel Farage the local UKIP MEP. "The figures being pumped out by the Government and the BBC are utter fiction", he said. "They claim that this £780 million chimera is expected to generate enough electricity to power 240,000 homes. Well it is expected only by the dishonest," he said. "Looking at Vattenfall (the operator's) own figures give a lie to this. Wind Farms operate on average at about 26% capacity, at best, which in their own world would provide energy for maybe about 130,000 houses. But even this doesn't take into account night usage where the production goes to waste." "Happily for the company though it will be picking up enormous subsidies for the production, of £40 million up front and approximately £60 million annually in Renewable Obligation Certificates (ROCs), taken direct from our bills as an undisclosed tax. Given that they claim (though the impact of sea salt on the precision machinery is not yet factored in), that these bird-slicers will stand for 20 years, they stand to make £1.2 billion. Enough to build a small nuclear plant," he went on. The great scam continues, the press lap it up, and nobody seems to care that the taxpayer is short-changed, the climate is unaffected and Britain will not have the energy generation capacity vital for our future prosperity and welfare". "21 so called Green jobs have been created. Possibly the most expensive jobs since Niel Armstrong stood on the Moon," said Farage. Not to mention the fact that wind power is the most inefficient and expensive form of energy production there is and the windmills will never make enough money to cover the cost of building and operating them. Paul Nuttall has issued a statement on the question of UKIP forming a pan-EU party. In connection with the possibility of the UK Independence Party becoming part of a pan-European Party, the following decision has been taken today. It has been decided that because of the concern of the membership and the complexity surrounding this matter, no decision will be made in 2010 on membership. As the final deadline for joining this year is 15th November, this means that there would not be sufficient time for a full and frank debate on this most important matter. If left till next year, the party can properly debate and consider the ramifications of this issue before the November 2011 deadline. This subject came up some time ago and marked the beginning of Nikki Sinclaire's open warfare with the party and Nigel Farage in particular. The European Empire has a £10m slush fund for funding parties that don't have MEPs and bringing them under the vassalage of those that do through the pan-EU party scheme which sees parties in the EU Parliament form alliances with other parties that don't. In UKIP's case this would have been an opportunity to put money intended to promote the eurofederalist cause to good use helping smaller eurosceptic parties build their profile in other countries. With lingering disquiet amongst the membership about the possibility of UKIP forming a pan-EU party, it's the right decision to defer this until next year but it's going to be a difficult job trying to convince the members that it's a good idea or even just putting across the facts in a way that members will understand. I hope that next year UKIP is able to take advantage of this money because at the moment the whole £10m is going to pro-EU parties who will be using it to promote the eurofederalist cause. Nikki Sinclair MEP is speaking at the English Democrats party conference in Nottingham this week prompting some members to speculate that she might be about to jump ship to the SS Steve Uncles. As Nikki doesn't support devolution it's unlikely that she'd support the English Democrats anyway but I don't imagine that her appearance at their conference is anything other a leg of her tour of party conferences speaking at fringes. She was at the UKIP conference a couple of weeks ago and she said she was going to visit every party conference this year (I don't think she made it to either the Green or Lib Dem conference though). It'll be interesting to see how Nikki is received by some of the more ... interesting characters in the English Democrats. Let me start by saying that I quite like Daniel Kawczysnki MP. He's one of the few honest MPs and a genuinely hard working one at that. But on the subject of voting reform he's got it quite wrong. He clings on to FPTP - and understandably so as a sitting MP for a marginal constituency - despite its obvious failing in ignoring the wishes of most of the electorate and returning a government that has the support of little more than a quarter of the voting population. My hon. Friend mentioned the elections to the European Parliament. If we are going to change any voting system, surely it should be those elections, in which only 30% of the electorate turn up to vote, because they are very unhappy with how we vote for MEPs. Conversely, in our elections the turnout is 70%. Most people are happy with the way they elect us, but not with how they elect their representatives to the European Parliament. As the Boiling Frog points out, EU parliament elections in the UK were held under FPTP until 1999 and the dismal turnout for EU elections has been comparably dismal since the first one in 1979. Watch you back Skeptyk, there's no telling how far the European Empire will go to protect their loyal foot soldiers, Greg Limp-Wrist and the Junius trolls. Mr Cameron will further set the tone of the relationship today when he tells the former Belgian Prime Minister that Britain will refuse to send its Budget plans to Brussels before being announced in Parliament. EU finance ministers have moved closer to agreeing to allow other governments to study their annual budgets before they are seen by national parliaments. The UK government said it would reject this plan, but EU officials said a compromise had been worked out. The budget will be presented to Parliament first. There is no question of anyone other than MPs seeing it first. Once the Chancellor has presented it to Parliament, it is of course publicly available. Starting next year, the 27 European Union members will have to submit their proposed budgets to the EU in advance, so that Brussels can scrutinize their plans before they take effect. Just to clarify: the EU, which hasn't had its own budget signed off for 13 years in a row by its own internal auditors, will scrutinise and revise the budgets of national governments. Sadly, the previous Liebour government repealed the death penalty for Treason. You can read the full story on how the deceitful ConDem coalition have agreed to illegally submit the UK budget to the European Empire before submitting it to Parliament here. These next few years are the most important for our country, our liberties and our party. And only through our Positive Vision for the way ahead will we be able to grow this party. That’s what we want, don’t we? To grow this party? To realise its real potential? The foundations are set, we increased our vote share by 50% at the last election. We have a full and comprehensive manifesto, taking the fight to the Coalition and Labour on everything from defence to the economy, to fisheries and immigration. Policies make us relevant. But we are the most underrepresented party in the UK, with nearly a million votes in May we have more votes than the Northern Ireland parties but with none of their 18 MPs. So we are today calling for a fairer voting system: Alternative Vote Plus should be an option on the referendum ballot paper next May. Now the Government may also create an elected House of Lords, and we could achieve an estimated 30 elected peers. So my Positive Vision for the Party is one of 20 MPs, 30 elected peers, and UKIP as the largest UK party in the European Parliament next time. But to achieve this vision, this party must grow up and professionalise. What we say and do isn’t just for us – it’s for them. It’s for the people we seek to represent - and the majority of the British people want to leave the EU. It’s for the media too. They need to respect us, and we to respect them by acting like a serious political party. It’s a call for our manifesto to be understood by our own spokesmen. It’s a call for us to be proactive, hitting the Coalition with everything we have from freedom of information to Parliamentary Questions to exposure of EU Directives. It’s a call for us to build this party – and that means winning the fight here instead of showboating in Brussels. And if that means fighting every council by election, or Welsh, Scottish or Northern Irish elections as if they were a general election, then so be it. If I am fortunate and honoured to serve this party as the next Leader, then mark my words: the lazy days of UKIP are over!! [p] The days of us only being accountable to ourselves for what we say, rather than what we do will be numbered. I believe a new UKIP must be a party of action, not of talk. Not a party of navel gazers or those who think their role is to compete with Dan Hannan for YouTube hits! A new UKIP has to think bigger and wider. We should be planning NOW how to be the number one British party in the European Parliament and to double our seats… not being content with being second. For Complacency Kills. And we should be doing all we can RIGHT NOW to win seats in the next General Election. It makes me angry that a Green MEP won a national seat in May – I commend Caroline Lucas for the professionalism that did it. If our own party had a more professional approach to how it was run, UKIP could have had one or two MPs in the Commons now. And so we owe it to you, as our party, our team, to win and have a plan to see UKIP grow and reward your efforts with victories. We owe it to the British people to stand as a credible opposition party worth their time and continued support. And we owe it to our country to stand up, proud of our policies and beliefs, to fight for this great nation. Now, we’re only a few months into the Coalition Government but already their approach to civil liberties is covered in so much spin and so much duplicity that it would make Peter Mandleson blush. They talk tough during the election campaign, but in office they’re auctioning off our liberties - left, right and centre. It seems where Labour finished, the Coalition merely carried on. You’d have to live under a rock not to see our freedoms disappearing. Every 8 hours someone in the UK is apprehended under the European Arrest Warrant, a scheme where British citizens can be plucked off the street and detained for years – for years – in foreign prisons without trial. The European Arrest Warrant has exported our right to a fair trial and no-one in the Coalition cares a damn… So it is up to us, to UKIP, to lead the fight to recover our lost freedoms. What war did we lose to be in a position where British citizens can be treated this way ? Did we all miss something? I am angry that our government thinks so little of us that it won’t defend us against arbitrary trial and imprisonment abroad. Yes, I’m angry. I’m angry with the previous government for allowing this to happen. And I’m angry with the current government for advancing it. Why did the UK government do nothing to free Michael Turner and Jason McGoldrick when they faced two years of imprisonment in Hungary? But when the governing parties sat counting their expenses and fiddling the system, it was us, it was UKIP, it was UKIP MEPs - Gerard, William and others -who fought to free these people. It was UKIP acting as the Real Opposition. It should tell the British people all they need to know; We are by your side. UKIP will defend your freedoms - today, tomorrow and beyond. We will safeguard your liberty come what may. Even after these injustices, the Coalition’s answer to this totalitarian law is to review it. Review IT? Mr Cameron, don’t try and fob the British people off with a ‘review’. A review is worthless to a family who have seen their loved ones condemned by dodgy magistrates or left to rot in a remote jail. You said ‘we’re all in this together’, Dave. Act like it then. I say enough is enough - we must scrap the European Arrest Warrant!It has no place in a country where we are innocent until proven guilty.It is a betrayal of what generations of heroes fought to protect. Of course the Coalition can blame Labour for signing up to the European Arrest Warrant. But Lib Dems like Graham Watson promoted it. But what the Coalition can’t do is shift the blame when they signed us up to the European Investigation Order only a few weeks ago. It should terrify us all that foreign authorities will be able to use this order to investigate us for crimes that are not even crimes in this country. It should worry us that we could all be investigated and tried for the same crime twice abroad. It should anger us that it’s OUR Government allowing foreign courts to direct OUR police to collect OUR private details – even our OUR DNA – for THEIR authorities! Look at those governments in Europe. Some have barely escaped Communism, yet David Cameron and Theresa May want them to be able to instruct and direct our police forces!! But this Coalition hasn’t given us a signal yet that it will stand on the side of law-abiding Brits. So far their approach to law and order is a throwback to 1960s ‘flower power’ politics. But what can you expect from Ken Clarke – a man who insisted Britain should join the Euro? He’s the epitome of a Lib Dem Tory - a perfect Coalition being. Ken Clarke began as Justice Secretary by declaring war on prison – not on criminals - rubbishing deterrents and favouring soft punishments as the key to fighting the war on crime. Thank God he’s not Defence Secretary or he’d be sending our troops into battle armed with blanks. But he hasn’t had a good start has he? Look at the convicted murderer Tracie Andrews, let out of prison to go on an 8-hour shopping spree. Some punishment that is! There is a reason, a good reason, why people feel the Government isn’t on their side. It’s because it isn’t on their side. The so-called Human Rights Act trumps the victim’s rights to justice. We can’t even deport foreign criminals who commit the most heinous crimes in the UK. Remember the tragic death of Philip Lawrence, the head teacher? His killer, Learco Chindamo, fought tooth and nail to remain in the UK and won his right to stay. Shamefully, our collection of New Labour laws and EU diktats kept him here. Did you also know he walked free this year? He has a right to remain in Britain, whilst Mr Lawrence was denied his right to life. What sort of country are we living in when over half the nation wants killers like Chindamo firmly punished, but our politicians and justice regime set murderers free? Just who is running Britain? Earlier this year I went to Bullwood Hall prison in my constituency. It’s one of two UK prisons solely dedicated to detaining foreign prisoners. It wasn’t until I was shown around that I came across this newspaper. ‘Inside Time’ is written for prisoners by prisoners. This one has 125 lawyers’ adverts so prisoners can harvest legal aid and legal leeches abuse the Human Rights Act to get them compensation. One prison governor I met is being sued day in, day out. The gap between what the people’s idea of law and order is and the politicians’ idea has become a chasm. Meanwhile, police stations in my constituency are already running half days, 6 days a week. We have Community Support Officers on the beat instead of real, qualified police. And we have a Human Rights Act that not only blinds justice, but ties her hands behind her back. As part of our Positive Vision, we will tell the people that a vote for us is a vote to scrap the Human Rights Act. It’s a vote to rebalance justice in favour of the victim and not the criminal. It’s a vote to deport criminals who have no right to be in this country. On all these issues, the voters were spun a message, trust the old parties and vote for change. What change? Your liberties have been sold off to Brussels and your right to live free from crime put at risk with Ken Clarke’s hippie policies. And you know, we’re so tired of being told we’re racist simply because we want to control and manage immigration - just as four out of five Britons do. But we can’t do that unless we are much tougher on illegal immigrants who abuse our hospitality, our liberties and freedoms. The Lib Dems aren’t the only fans of amnesties for illegal immigrants. Boris Johnson, the London Mayor, is too. So are Spain and Italy. Yet the Portuguese amnesty was a disaster. And for every amnesty in the EU, that’s more EU passports and more illegal immigrants given the right to stay here in Britain. To claim welfare in Britain. To gain housing in Britain. Ladies and Gentlemen, this has to stop. I am proud that our policies will limit and control immigration. We will rebalance the process and introduce a fair points system to get the best from immigration. The message must be: If you want to come to the UK, you must be able to speak English to a reasonable degree. If you want to stay in Britain you must be in good health and have excellent qualifications – so you contribute to our economy. Most importantly, if you want to come and live in Britain you should be able to financially support yourself. You wouldn’t be able to turn up and claim benefits in Australia or New Zealand, so why should you be able to claim here? So UKIP will end the ‘welfare from day one’ policy for new immigration. In short, we want immigration to be fair. Yes, we want immigration to benefit Britain. But these abuses must end. Looking ahead, perhaps the biggest test for us all is the coming Spending Review. Remember, that for each cut they make to a front line service, they are still employing armies of politically correct bureaucrats. The street football coordinators – they will still be there. The diversity officers will be protected en masse. The community empowerment network programme managers – they’ll be safe from the axe. This is the ploy of big government. They will cut where it hurts to trick you into handing over more in taxes, to give government yet more control. We will fight cuts to the front line without taxing you more. We will fight to scrap regulations and political correctness that cost us billions. We will reenergise our economy with low taxes: UKIP says no tax on minimum wage and end employers’ national insurance – we must create new jobs. And we want to be free from the EU so we can grow trade in a Commonwealth Free Trade Area. We will be a free economy with a global reach able to do our own trade deals once more. It’s no good Mr Cameron going to India with a trade delegation if Britain can’t even do its own free trade deal with India – the protectionist EU does it for us ! The fact is we could talk about the EU all day, but if we do not address these bread and butter issues, from pot holes to jobs and taxes, we will stay as we are – a one hit wonder at Euro Elections. We’ve got to get real. In our Positive Vision for our Country, we free ourselves from the EU so we can implement these policies. We will explain the process of leaving and the advantages of becoming a free, independent nation once more. Eurosceptics are sometimes criticised for being all negative but this is about a positive, credible, reasoned, common sense alternative to EU membership. UKIP should be FOR something not seemingly AGAINST everything. 1.‘Britain will lose 3 million jobs by leaving the EU’! Not true. We’d have a new trade agreement. 2.‘It is not possible to leave the EU’. Not true. We can repeal the Act and leave in a day! 3.‘Britain would lose influence in the world’. Not true. We are a major player in our own right. It’s actually a question of legality and political momentum. UKIP is the only party which can start that momentum, but we will work in partnership with others. Under my Leadership, I will put together a coalition of leading politicians and renowned legal experts, trade officials, former heads of state and senior civil servants to demonstrate the process of withdrawal and the great advantages of being outside the EU superstate. That is our Positive Vision. This work begins today. I can’t believe UKIP has not done this work before. It is so essential and obvious to our cause. Now we must show the British public how easy, practical and achievable it is to leave the EU and be free again. It is NOT impossible, it’s actually straightforward. But the process of dialogue between the key players must start immediately. Unless we do this, what will we tell our grandchildren when they ask us what we did as UKIP MEPs? That we just went to Brussels to pick up allowances or get on TV? Or that we spent all of our time bickering like children – I say that this party in-fighting must end! Too much amateurism has been allowed to creep into the party so that individuals place their own political legacies first – which I want to stop as leader. I want to begin a meritocracy in UKIP which allows talent to flourish and for the party to be properly managed. And then, we can be driven by results. By election victories. We will professionalise so that we can get our country back. It’s our only direction if we are to sleep well at night knowing that we did everything we could to save what we will soon only remember as British identity and values. Ladies and Gentlemen, it’s time to be, rather than to seem. To deliver more and rant less. Time for more statesmanship, and less showmanship. Under my Leadership, no one will ever question UKIP’s credentials as a Eurosceptic party. We will show the country that we are determined to do whatever it takes to remove Britain from the shackles of European Union membership. 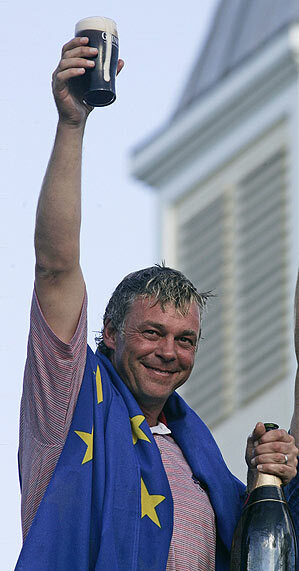 And you have my word: I will never rest until this is achieved! A welcome call for an end to party in-fighting from DCB and a crafty swipe at a certain other candidate. This is going to be an interesting contest! It's reassuring - and entirely co-incidental, I hasten to add - to hear Nigel saying his leadership, this time round, would see him as "a campaigning politician, as somebody that is out there meeting the public, garnering votes". This is what I have said on the UKIP members' forum the role of leader should be - the public face of the party, the person people vote for (voting for parties and policies is so last year), a schmoozer. Paul Nuttall announced, a couple of days ago, that he is standing down as Chairman of UKIP. This is a shame because Nuttall is a real asset to the party but he is an MEP and has a young family and wants to commit more time to improving UKIP's fortunes in the north east euroregion of England. Nuttall would make an excellent replacement for Lord Pearson as Leader but has already ruled himself out of the contest. Perhaps he'll be able to stand as Leader now he's resigned as Chairman? Hartlepool branch of UKIP made a spoof application to the Europe Direct EU propaganda quango for a grant to hold a celebration of European Day of Languages and was sent an email confirming that they were entitled to a £50 grant! In addition to the £50 grant they were also offered free bunting, maps and books. Europe Direct figured out for themselves that the application was suspect when Hartlepool branch members kept stalling them and have reported the branch to Durham County Council's "fair trading officer" (presumably the new name for trading standards) as a "seemingly scam applicant" and not at all out of spite for being made to look like idiots. Hartlepool branch made the spoof application to highlight the willingness of the European Empire to hand over our money to all and sundry for propaganda purposes. No money changed hands. Pretend eurosceptic, Dan Hannan MEP, reports that Emperor Barroso has decreed that MEPs will be fined if they don't sit through his rambling "State of the union" propaganda speech. 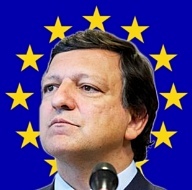 The electronic voting system - usually only used when an MEP calls a point of order when Barroso lies about the result of a show of hands - is to be used 3 times during the speech and MEPs that don't press their voting buttons 2 out of 3 times will be fined. I'm sure UKIP's MEPs will do something amusing - turn their backs or put on a pair of ear defenders or something. Dan Hannan will probably sit quietly listening to Emperor Barroso like a good little eurofederalist Tory. The European Empire has managed to find an innovative new way to lose money to fraud and corruption - by giving €55.6bn to Albania, a country that somehow manages to be more openly corrupt than the bent eurocrats in the EU. One project funded by our taxes is the almost €1.1m "Works for Reconstruction of roads of Village Marqinet 1 and Llanaj neighbourhood" awarded to an Albanian company, Albavia sh.p.k. Marqinet is a village north west of the Albanian capital, Tiranë whilst Llanaj is in a forest in the mountains with no major roads. How does this benefit us here in England? Another is almost €2m for the "rehabilitation of infrastructure" around the mediæval castle on Rrugë Murat Toptani in Tiranë. Which is nice but the castle is just ruins, literally a few stones above ground level (page 14 of this PDF). What infrastructure is there around a few lines of stones in the dirt that can absorb €2m in infrastructure costs? How does that benefit us here in England? The highest paid public official in Albania is the President who is on a salary of $12,612 (£8,166). The GDP of Albania is only $12.39bn (€9.54bn) but the EU has "invested" €55.6bn into the Albanian economy. There are some quite serious questions that have to be asked about all this money that's being pumped into Albania. Firstly - and most importantly - why is the EU giving our money to Albania when Albania isn't even part of the EU? Secondly, why has the EU pumped six times the GDP of the entire country into just 97 projects in one year? Finally, with €55.6bn of our money being spent in just one year in Albania, why is their GDP still only €9.54bn? Even RBS would struggle to make losses of that magnitude on a €55.6bn investment. Jeffrey Titford was appointed as interim leader by the new NEC in Torquay yesterday. 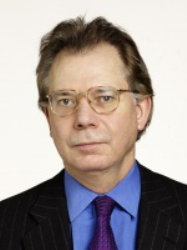 Titford was UKIP leader between 2000 and 2002 and was a UKIP MEP for the East of England until last year when he decided not to stand for re-election. Jeffrey is an excellent choice for interim leader, an established politician, former leader and well known. In other good news, Nigel Farage has decided to stand again for leader of UKIP. Nigel is by far the most successful leader we have had and easily the most recognisable and media savvy senior UKIPper. Frank Maloney has ruled himself out, as has Paul Nuttall. The "big names" who intend to stand for leader are Nigel Farage, David Campbell Bannerman, Gerard Batten and Prof. Tim Congdon. Unless there's a mystery contender yet to declare their intentions, the contest is a two-horse race between Nigel Farage and David Campbell Bannerman and Farage has got to be the favourite. 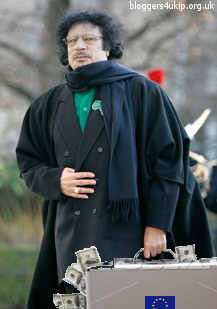 Colonel Gaddafi has demanded £4.1bn off the European Empire to stop illegal immigration from Libya. Gaddafi used a visit to Libya's former colonial ruler, Italy, to make a speech calling for the Italians to convince the European Empire that they need to give him €5bn to counter "the risk of [Europe] turning black from illegal immigration". This is blackmail from a delusional dictator. It is outrageous that after calling for us all to convert to Islam, he is now threatening to send us Africa’s poor benighted masses. Gaddafi is an unelected dictator, a racist, an Islamist and now he's demanding money with menaces. Will our spineless masters in Brussels tell him to bugger off or meekly hand over the money? I think we all know the answer. Tomorrow is the first day of UKIP's annual conference and it promises to be an interesting one, with the new NEC only having been elected a few days ago, the resignation of Lord Pearson and the appointment of an interim leader to replace him. Sadly I couldn't be at the conference again this year - not only is it my daughter's birthday today when I would have to start travelling but Torquay really is the arse end of nowhere and the expense and hassle of catching three trains from Telford to Torquay, travelling for 4 hours, is less than appealing. Had I been going to the conference, though, I would no doubt have ended up lending a hand with the Campaign for an English Parliament's stand. The CEP was invited to set up a stand at the fringe by David Campbell Bannerman following a meeting with the chairman of the CEP a few weeks ago. I'm told that DCB is still clinging on to his nonsensical stance on devolution, even though he admitted that the policy he personally devised would never be accepted by the Scots but it's reassuring to see our deputy leader listen to an alternative viewpoint and encourage debate at the conference. The CEP's flyer for the conference can be found here and the debate is at 12:45 tomorrow lunchtime (Friday). Supporters of devolution might also be interested in the UKIP 1997 Group.